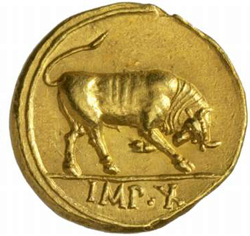 Here is yet another early coin with an animal, a gold aureus from Augustus 27-15 BC from the collection of the Geldmuseum. If I remember correctly, the statue of the bull was a war trophy. That "bull" is in fact a heifer, it is generally believed to represent a group of bronze statues cast in the fifth century B.C. After his victory at Actium, Augustus requisitioned from Athens four massive statues of cattle that had been created by the sculptor Myron. They were monumental prizes of great antiquity and Augustus used them to adorn an altar in his Temple of Apollo on the Palatine. Here is a bull for comparision. 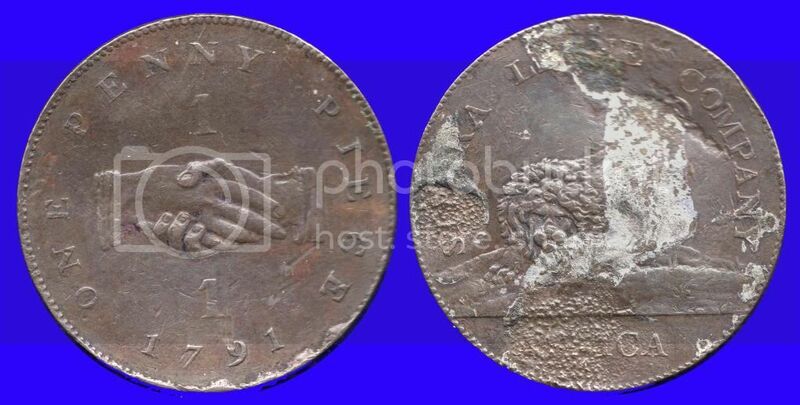 Ancient anecdote: "In vain, bull, thou rushest up to this heifer, for it is lifeless. The sculptor of cows, Myron, deceived thee"